Does it ever seem that the circumstances you face are so complicated that there is no way out? No matter which way you turn, you only see trouble. In those moments, we have a tendency to focus on the problem rather than God and His power to conquer any obstacle. When problems arise, we begin to question. What are we going to do? How are we going to overcome this? In Exodus 14 while escaping the oppression of the Egyptians, the Israelites began to question why they were brought to the desert, what Moses had done by leading them out of Egypt, and why they even agreed to follow him. Exodus 14:13-14 says, Moses answered the people, “Do not be afraid. Stand firm and you will see the deliverance the Lord will bring you today. The Egyptians you see today you will never see again. The Lord will fight for you; you need only to be still. They were focused on the obstacles, and their thoughts and actions were controlled by fear. How often do we find ourselves in that same situation? Instead of focusing on the problem, who to blame, and how we can fix it, we must turn our focus to God. As stated above in Exodus 14, sometimes we must calm our fears, be still, pray, and trust God to make a way in His perfect time. Other times though He may tell us to “get moving”. Exodus 14:15 says, then the Lord said to Moses, “Why are you crying out to me? Tell the Israelites to move on. Raise your staff and stretch out your hand over the sea to divide the water so that the Israelites can go through the sea on dry ground. In other words, “I’m opening the door, now you need to follow my instructions and just move on through it”. Psalm 77:16 says, When the Red Sea saw you, O God, its waters looked and trembled! The sea trembled at the power of God; there is no obstacle which is greater than His power! Psalm 77:19 goes on to say, “Your road led through the sea, your pathway through the mighty waters – a pathway no one knew was there!” God was able to part the Red Sea leaving a dry path for the Israelites to cross escaping from the Egyptians, and He still has the power today to open doors for us that we may not even know are an option. I’m sure it was terrifying for the Israelites to step out onto that ocean floor with an enormous wall of water on either side! The door that God opens for us may be scary, but if we’ll just trust Him and move on through it, we will see the power of His deliverance. When it seems as though the enemy is winning, God is still in control and knows exactly what to do. So instead of focusing on the problem and how we can fix it, we must not let fear control our actions. We must choose to trust God and wait patiently for Him to make a way. We must obey and move on through when He says it’s time. Even when our problem seems as big as the Red Sea with no apparent solution, God has the power to make a way! This is something that has been on my mind lately, so I thought I would share it again. Yesterday I hesitantly went with my daughter for her first visit to the chiropractor due to back pain. I sat in the corner of the room preferring to be in the waiting room or shopping, but because she wanted me there, I went. I recoiled as I watched him apply pressure, twist, and jerk her body. Joints popped and her body twisted abnormally as the chiropractor made adjustments. He assured me it looked much worse than it felt, but I don’t think he will ever be seeing me again! My daughter however was astonished at the difference it made in the way she felt. The adjustment appeared to be uncomfortable to say the least, but the results were worth it to her. Often we must go through uncomfortable adjustments in life to get everything lined up just as God desires it to be. Those adjustments often come in the form of change. I don’t like change, so when it is forced upon me, my life feels twisted and uncomfortable. Changes in job duties, expectations, schedules, health issues, finances, leadership, and on and on but there is one thing we can count on that never changes. In Malachi 3:6 God says, “For I am the Lord, I change not.” (KJV) Regardless of the changes making our lives uncomfortable, we can be comforted in know that God is the one thing that will never change. Change is inevitable, so it is beneficial for us to have a godly approach. Matthew 11:28 Jesus says, “Come to me, all you who are weary and burdened, and I will give you rest.” (NIV) When change is causing knots of frustration, we may need a spiritual adjustment. We must simply go to him and receive the rest that only He can provide. When life adjustments happen we can trust that God is the same today as He was yesterday, and He will remain the same tomorrow and forever. Pressures of life may cause us to recoil and wonder how we will survive. It may be tempting to run away from the change, but doing so does not allow God to get things in proper alignment. 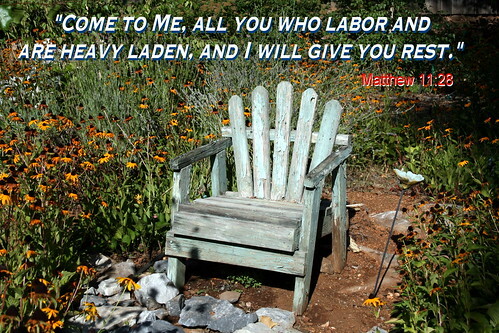 Instead we should go to Him for rest and trust Him as he gives us a spiritual adjustment. The blessings will be worth it all! Do you ever have moments when it seems as if your whole life has been turned upside down and you just don’t know if you can handle any more? Sometimes life is overwhelming. I recently found a garden snake in our elementary building. Considering that our students would be returning on Monday, I knew the snake had to be expelled from our school. What seemed to be a fairly simple task became overwhelming when this harmless snake began trying to defend himself. Although he was not venomous, he did a good job of convincing me that he wasn’t leaving without a fight. I became overwhelmed by this aggressive little critter that repeatedly sprang at me the full length of his body. I knew he wouldn’t hurt me, yet I just wasn’t sure I could even try anymore, so I finally called for help. My husband came, made a quick capture, and calmed my racing heart. Sometimes we get overwhelmed by the simple things in life which can be resolved easily, but often we are faced with moments which turn into days, months, or even years of being overwhelmed. Job demands, health issues, rebellious children, strained relationships, addictions, financial restraints, and so many other circumstances that may leave us feeling defeated. Big or small, short-term or long-term, life is full of situations that stretch us emotionally, physically, and spiritually. There are many examples in the Bible of people who were overwhelmed with their circumstances, from Martha who fretted over preparing a meal for Jesus to King David who feared for his life. So what can we do when life seems turned upside down for the moment, days, weeks, or even months and it feels like we just can’t handle any more? Talk – We weren’t made to survive life alone. After all, God made Eve because He saw that it wasn’t good for Adam to be alone. Find someone who you trust that has been through a similar experience. Sometimes just talking helps us feel better. Most importantly, talk to God. James 5:13 says, “Is anyone among you suffering? Then let him pray.” In Psalms 61:2 David said, “I will cry to you when my heart is overwhelmed.” God hears when we cry out to Him. He can provide shelter, peace, and comfort. Trust – Abraham was surely overwhelmed in Genesis 22:1-14 when his faith was tested, yet he trusted God. Proverbs 3:5-6 says, “Trust in the Lord with all your heart, and do not lean on your own understanding. In all your ways acknowledge him, and he will make straight your paths.” Philippians 4:13 says, “I can do all things through Christ who give me strength.” We may not understand why situations happen in our life, but we can trust God to give us strength to endure. Tackle It – In Genesis 6:13-22, God called Noah to build an ark so large that God had to close the door. What an overwhelming job he had! He didn’t just sit back and hope God would take care of it for him. Noah jumped in and tackled the task as God led. Ephesians 6:10 reminds us to “be strong in the Lord and in his mighty power.” You can’t do it on your own, but He will give you the power to get through those overwhelming situations. Time – Joseph struggled for thirteen years before seeing God’s plan fulfilled. As a child Joseph had a dream that he would become a ruler. His brothers sold him into slavery, then he went to prison for a crime he did not commit. Eventually, he became the most influential person in the world. (Genesis 37-41) It took a lot of time, but Joseph did not give up and continued to be faithful. We only see the current circumstances, but God sees our future. Hebrews 13:5 says, “I will never leave you, nor forsake you.” Regardless of how long we are overwhelmed God will be there with us. When life is overwhelming, and you feel like you just can’t take any more, remember to TALK to Him, TRUST Him, TACKLE IT with His strength, and allow TIME for God to work. He loves you, and will see you through those moments when life seems turned upside down whether for the moment, days, weeks, months, or even years.